Jesus used earthly common things in His stories so that all could understand. If one lives in the Holy Land, a person learns more about native crops, animals, etc., so the imagery and understanding deepen. For instance, the sheep images and olive tree images come alive as you learn more about them. If you are a modern person living in Iceland, these examples are not going to carry over in the same way. But the most well-known parables are unique in that they can be understood by anyone, anywhere, any time. Their images are clear, because Christ personally explained the message of these parables to His disciples (and they, in turn, have explained the messages to us). Watch to see which parables had the most hidden messages. Christ just told the stories to the pressing crowds and did not identify what His images were referring too. The parable of the sower is one of those stories where the “vehicle” is there (the images of the seeds that flourish or die for various reasons) and not the message the vehicle displays (what is true conversion?). Christ seemed to want to hide these messages from people (Matthew 13:10 – 17; 34, 35). Remember that the hordes of people who came to see Him preach and heal were a very mixed group. Christ could discern their hearts and minds. Some were curiosity seekers. Others were sincere. The Holy Ghost could convey spiritual truths to sincere seekers. Hiding knowledge from some actually relieved them of living up to new-found spiritual knowledge until they were more ready. You might want to discuss this. The Lord withholds knowledge from us, too, as we learn line upon line. It’s for this reason that part of the Book of Mormon is sealed and withheld from us. The message of the Parable of the Sower was visible in the crowds that gathered around Christ. There were many who believed and followed and then turned away. Their testimonies were fickle. This happens today also. Missionaries have stories about converts who have quickly fallen away, never developing gospel roots, while others bear abundant fruit. The lesson manual encourages us to discuss what it means to be fertile ground for the gospel message. Tares are bitter and even somewhat poisonous. But they look identical to wheat when they are young. It’s impossible to pull them out when they are young without confusing them with nourishing wheat. But they betray themselves and show what they really are as they mature. When the harvest time comes, the wheat and tares can be separated. Note that the tares are gathered out first and burned and only then is the wheat harvested. This will be the order of things at the Second Coming of Christ. The wicked will be destroyed and then the righteous rewarded. When Christ talks about “the kingdom of heaven” in these parables, He means the kingdom of heaven on earth, or His Church. One thing you might want to discuss is that all things that God has created have agency, and they choose to obey and uphold God. 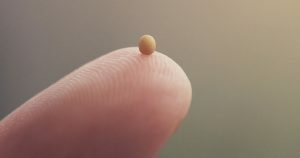 Would a mustard seed obey God by fulfilling the measure of its creation? Would it be more obedient than we are? Probably, yes. And the size of that seed gives no indication of the height it can grow to. This is indicative of our own potential. A treasure in a field (v. 44); a pearl of great price (vs. 45, 46); a householder (v. 52); and a fishing net (vs. 47, 48). Again, the bad are separated from the good, and the good see the Kingdom as a treasure well worth sacrificing everything for. These women followed Jesus both spiritually and physically and ministered to His needs. Why are people who have much added upon and those who have not see things taken away? Gospel understanding is received by the Spirit and a person who is constantly seeking the Spirit and serving Christ gains faith and knowledge line upon line. A person who rejects the gospel and fails to nurture his natural spirituality eventually loses it. It is similar to the parable of the sower where a hostile environment chokes and kills what tentative life has taken root. These verses are a scathing rebuke from Christ for those who think they are chosen because they are of the blood of Israel. He talks about approaching heaven and trying to join Abraham, Isaac, and Jacob and finding out the door is closed and locked. He conveys that the exalted will be from every part of the earth and not just from the tribes of Israel, according to their worthiness.